US oil production is starting to grow again. We think US oil production is going to inch up to 12.4 mb/d by June. We have US exiting 2019 at 12.9 mb/d. But this is only +1 mb/d exit-to-exit which is 50% less than the exit-to-exit growth of 2017 to 2018. On a year-over-year basis, US total liquid growth will still be elevated at +1.81 mb/d. But our analysis indicates even though that our US shale production is higher than the consensus, the oil market deficit worsens by year-end. Looking for a community to discuss ideas with? HFI Research features a chat room of like-minded investors sharing investing ideas and strategies. Welcome to the starting to grow editionof Oil Markets Daily! At the end of last year, we created a gauge to measure whether US oil production was increasing rapidly as the EIA weekly oil storage reports were suggesting (weekly + adjustment) or it stalled. We started to track the weekly US oil production figure and the weekly natural gas production figure to see the overall trend. As you can see, part of the positive adjustment in Q4 last year was related to EIA underestimating US oil production growth, but with the frequent revisions, we are seeing this metric all caught up now. The last 4 weeks of adjustment is slightly negative as you can see on the top right chart. Based on what we are seeing, US oil production is starting to grow again.At the moment, the Q1 stalled growth scenario panned out with US oil production finishing 2018 at ~12 mb/d and finishing March 2019 at 12.1 mb/d. The increase of 100k b/d is exactly what we wanted to see for our bullish supply and demand balance for 2019. We forecast US oil production to exit 2019 at 12.9 mb/d. Total liquid growth y-o-y in 2019 is +1.81 mb/d (high exit = high y-o-y). Exit-to-exit growth of 1 mb/d or a 50% reduction in growth from 2017 to 2018. 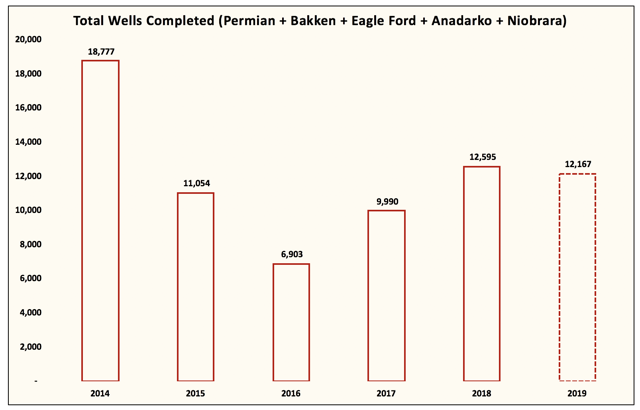 Over the next several months, we expect US oil production to grow by ~100k b/d per month. This should start to increase more pronouncedly by June. 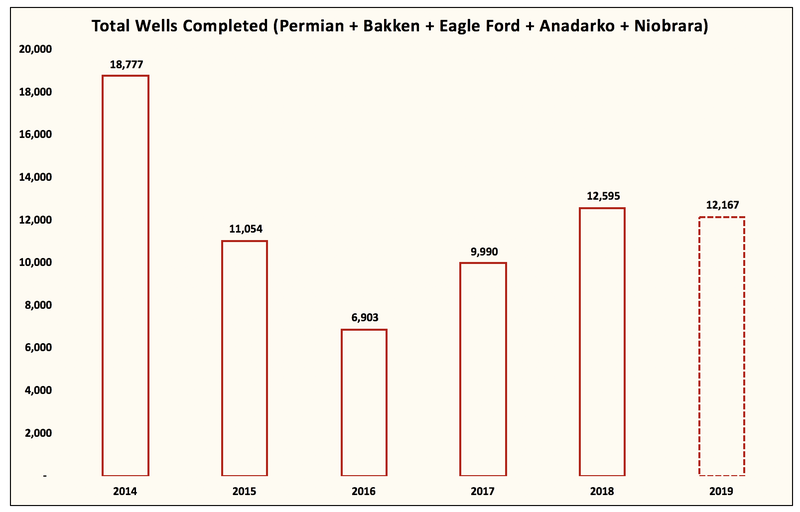 For readers being attentive to the US shale growth scenario, the issue of parent-child well issues won’t impact our growth estimates until 2020. The much lower exit-to-exit growth rate between 2018 and 2019 will impact the y-o-y growth rate in 2020. We estimate that 2020 will only see US total liquid growth increase by ~1.3 mb/d with exit-to-exit from 2019 to 2020 reduced to just 500k b/d. Timing wise, this is when you see the “treadmill” get faster. So, interestingly enough, one of our variant perceptions this year is that we think US shale will grow “more” than what the consensus is assuming, not less. But our analysis continues to indicate that even though US shale is expected to grow 1.81 mb/d y-o-y, oil market deficit continues to increase throughout 2019. We think that may be the surprise people are not expecting.